Dark Angels: 2 Section, 3rd Squad (Tactical), 2nd Octavius Crusade Company. | Azazel's Bitz Box. Dark Angels: 2 Section, 3rd Squad (Tactical), 2nd Octavius Crusade Company. Here we have the newly-raised second 2 Section of 3rd Squad. 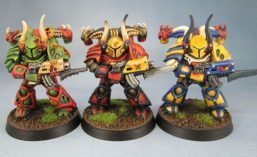 Having previously been a seven-man squad, it necessitated the addition of three more models to being the unit up to legal 8th Edition. The first of these is the Corporal. 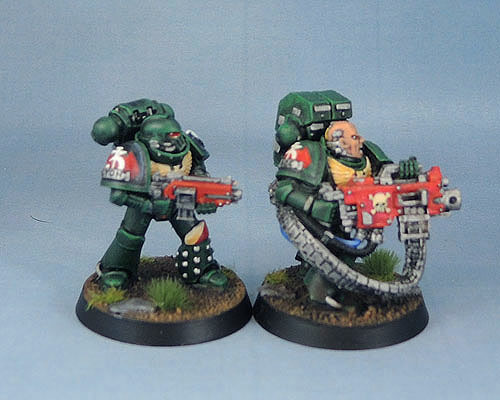 I know that officially Corporals aren’t a thing in 40k, but then, Lieutenants were missing for 20-odd years before magically reappearing a month or so ago! The Corporals in my marine forces are the guys who run the other combat squads – usually the fire support bit. 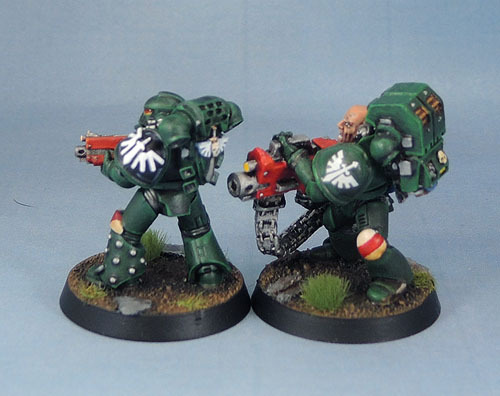 I’m giving the Dark Angels Corporals a metal should pad with a simple, embossed chapter badge, and black pauldrons. This corporal is one of the three new builds for this squad – MkIV legs and helm, MkVIII torso, MkVII arms, a DA Backpack and a Tigrus pattern bolt gun. I wanted to give him a look of being a bit special with the archaic armour and weapon, yet tie him to his Sergeant via the MkVIII torso with its distinctive gorget. 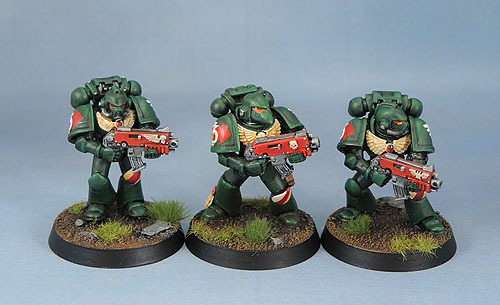 These three marines include the other pair of models added to the squad. The central model is one of the originals. The two flanking him here are 2nd edition Tactical marines. Since the rest of the squad is old-school and minimally-blinged, what better models to use in it than 2e Tactical marines. 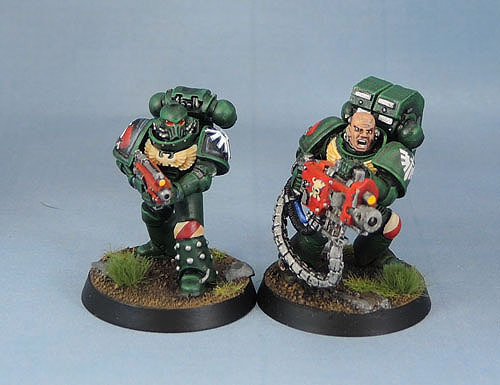 I have given them more modern arms and bolters – because frankly outside of a specific use, the chunky arms and bolters from those days just don’t work for me these days and those older base models look just fine with them. Here we have 2 Section of 3rd Squad. Prepared to hunker down and give their brethren supporting fire so they can advance, or join them in the forward advance as needed. Great work 👍 though whilst I agree with you about the arms I really like the old 2nd ed era bolters (though I admit they are a bit wide). Sweet 🙂 Loving this little project mate – tickles my nostalgia spot something fierce! Great looking bunch! Love the thought and care that has gone into these fellows and the little details that give life to the minis! Thanks mate. While I’m not usually one for creating “narrative” backstories for my characters, whom I only sometimes name – I do like to think about the “mechanical” side of narrative details – how things work in terms of organisation and structure so that it makes sense (in the context of space knights wearing brightly coloured armour with heraldic designs on them and using swords in a space-gunfight! More greatness from you. Still new to me! So keep them coming! Thanks Mark! Glad you’re enjoying them! 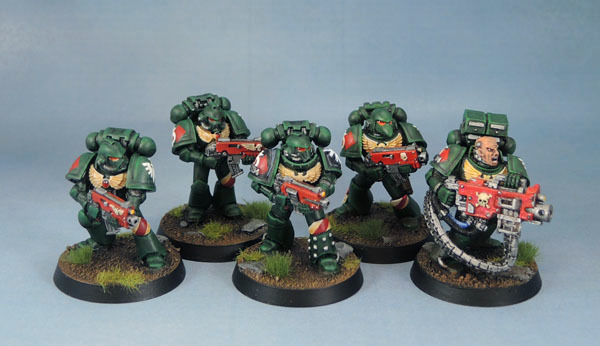 Pingback: Dark Angels: 2 Section, 4th Squad (Tactical), 2nd Octavius Crusade Company. | Azazel's Bitz Box.